The NOSE RIDER is the classic longboard for those wanting to surf with style and grace. 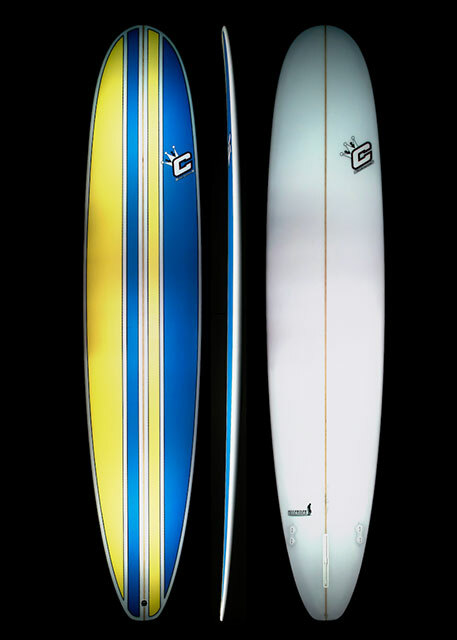 A generous wide nose with parallel rails into a classic hip and a soft squash tail. The board gives stability while on the nose and manuverability from the vee towards the tail which assist with the rail to rail transition and the stall cut back. The rail are medium to full and the entry and exit rockers are medium. Fin set up consists of a centre box fin with two side fins. For those dreamy glassy days from small to medium size surf bringing out the style in you. Choose the volume to suit your needs.